For some time now, I have been searching, reading, and exploring my Japanese heritage. I went to Kyoto, Japan last October with that search in mind. A trip to Japan had been a life long dream and I felt such a strong connection to the culture and aesthetics that I am planning another trip there next year. I feel as if my search has only just begun. Here are bits of Japanese papers, old letters, receipts, and worn and rusty objects that I found at the temple flea markets in Kyoto. I hope that some day they will find themselves in some of my collage paintings. 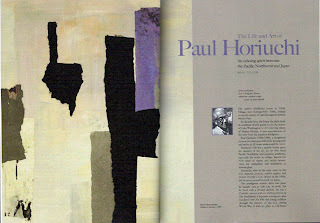 Below is a collage by Paul Horiuchi. 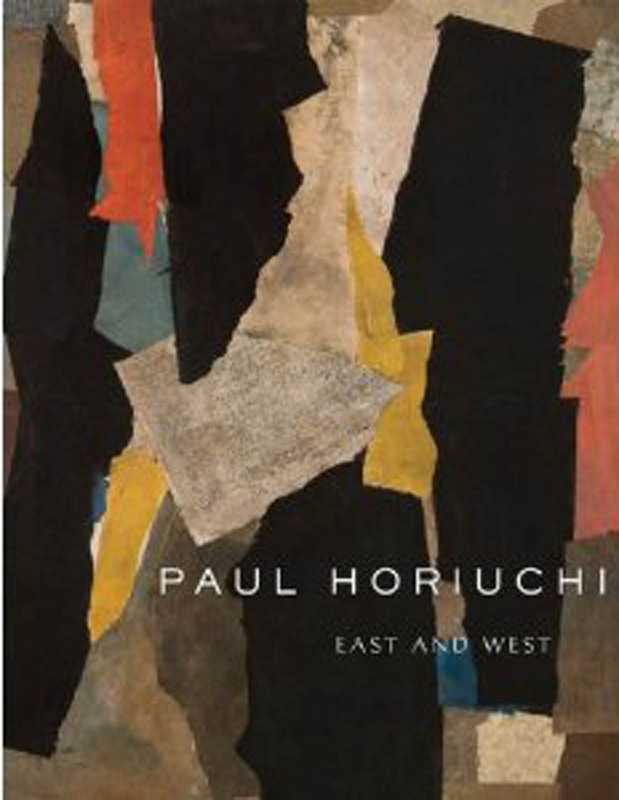 Paul Horiuchi has been dubbed a "Master of Collage". He was born in 1906 in Japan, and died in Seattle in 1999. He created graceful juxtapositions of texture and color, using paint, ink and paper. 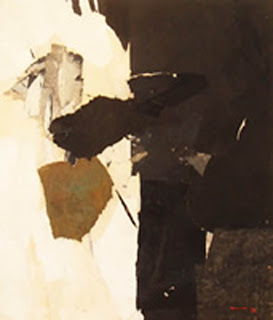 He pieced together torn pieces of calligraphy and textured papers, visualizing strong aesthetics of his Japanese culture. Horiuchi drew on his heritage, creating works that abstractly evoked the forms and textures of nature. His work exudes quiet energy and calm. Horiuchi once said that his collages were "attempts to produce areas of peace and serenity...". 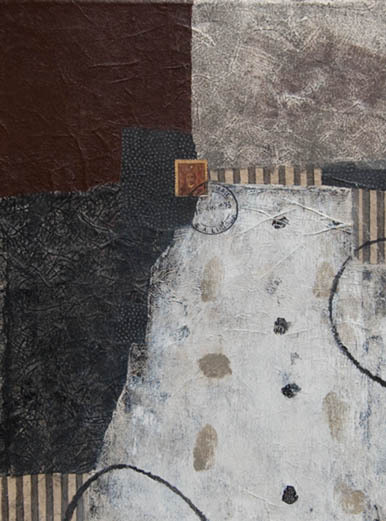 His meditative collages are strongly connected to reality. In the surprising collage titled "Rock Garden" (below) Horiuchi abandoned his more well-known very flat abstractions to provide a sense of space and place. 625 First Avenue, Suite 200, or www.SeattleArtResource.com. 'grandfather's envelopes' over at SRI threads? 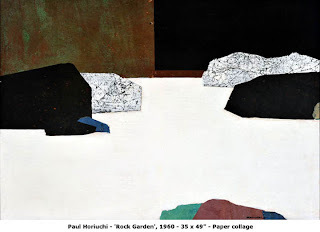 loved the image 'rock garden' by horiuchi. the horizontil emphasis is interesting. Japanese heritage...and the mood of your own work Donna... no wonder you have desire to trace that... loved those finds from the Kyoto market. My 2 weeks in Japan in 88 were at the end of 2 long exhausting years of intense work and travel...so ... the humidity and my weariness robbed me of the energy for exploring a fascinating country! ...but still something penetrated through the fog! Your collage is super...instantly recognisable as yours. Thank you for the introduction to Horiuchi, his work really does produce "...areas of peace and serenity...". Thanks for the introduction to a new artist. Something very striking about how he uses the colour black. wow, your picture with your future collage pieces already looks like a work of art to me, very cool finds. 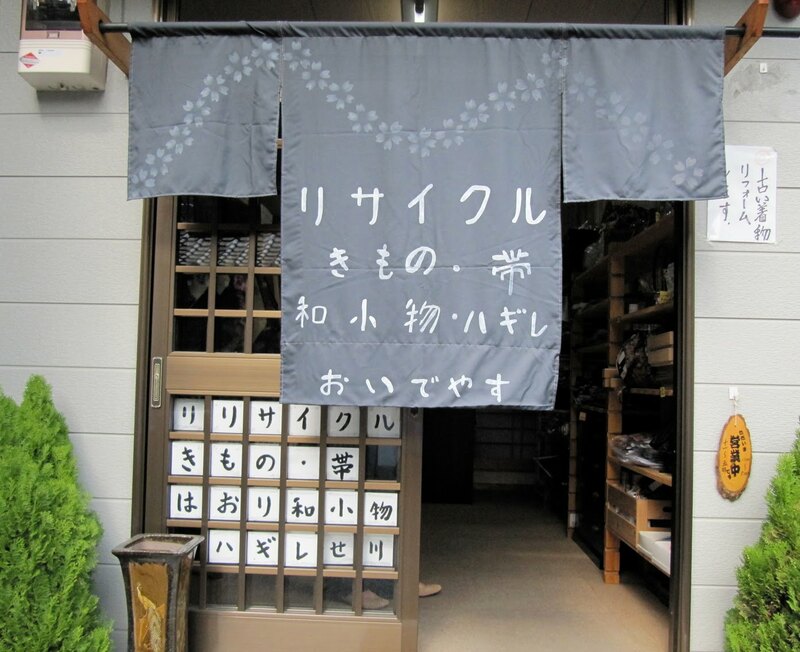 sounds so exotic to say that you have Japanese Heritage, great reason to go back and find out more! I really enjoyed that introduction to such a talented artist. It's always inspirational to see the way others have taken. Funny - I used to follow Sri Chinmoy back in my younger years! A feast for the eyes. I could meditate on your photo of Japanese ephemera ..... and your work always provides a wonderful place to rest. In the words of Horiuchi ..... "areas of peace and serenity". Donna, your blog has a flavour that I love. I am entranced by Paul Horiuchi's work...I agree with Annie about the striking use of black and his strong simple shapes also bring Milton Avery's landscapes to mind...and always by your work brings me to the shore/an edge place of the most delicious restfulness. How wonderful to travel to a distant land and feel the connection to the ancestors. What is the most profound thing that you have learned in your journey to explore your heritage? Thanks for the further education, I will definitely look into Horiuchi's work, such strong pieces. Your collage is beautiful and I can't help but think of the rich brown earth and snow when I look at it. Lovely. Always a pleasure to read your blog. beautiful collages from two masters. thank you. love your collage Donna and so sorry that I didn't realize that you were on Camano or I would have tried to link up or at least see your gorgeous work in person! I did pick up some info on AOT gallery and the invitation to submit my work, so that was nice. this is a wonderful post, so glad to know that you are pursuing your heritage, it is so very important to me to know who I am and where I came from. best of luck to you in this pursuit! Wonderful post. Kyoto is one of the most fascinating and beautiful cities I have ever visited. I ate yakisoba, there. The value transitions in your work here are fine. Thank you for posting it. lovely works and your journey into your heritage...so deep and enriching. Thank you for introducing us to this artist. And for sharing with us your personal search. Your exquisite posts never fail to touch and inspire me. I love that through careful placement and mark making papers can become the vehicle for thoughts, emotions and personal journeys. It's awesome that you are able to draw on your heritage too, something I feel I am missing as a 'mixed breed' kiwi! Glad to read you will be able to go off exploring again! great collage and post - my best. Following our heritage, spiritual practice or other connections is such a rich experience. Thank you for this artist introduction and as always a beautiful piece of yours posted. Will you be returning to Kyoto or expanding to other cities? Reading about your Japanese heritage made me understand and like your work even more! I love Japan, I love Kyoto, actually I am going to be there next month! oh you lucky lady, l am fasinated by anything japanese.Love their writing art, cultures and clothing. I also am really jealous of your finds. But also glad for you. I really like your art . I am an Art therapist, Artist and Photographer living in london. I made books, alter books and other found items, make collages, silk paint and so on! Lovely Japanese papers and I love the quiet in your work. So much beauty in Japan, in your work, these pieces of papers, and the artist you introduced to us. my son (14) is going to Japan this Summer as a student ambassador, he will be going to Kyoto and I know what to ask him to bring to me, I already did. Wonderful images, Donna. Love your collage, as I do all your work. Horiuchi's work is intriguing, as are the photos of all the cool stuff you found in Japan! I'm so jealous- I've always wanted to travel to Japan. Exploring your heritage can be a fascinating journey of discovery, revealing pieces of yourself you hadn't before recognized. You may fill in some puzzles, while finding new ones to solve. It is definitely enriching, on so many levels. I love the papers and objects you collected! His work does give such a feeling of peace and clarity. I can see why you would be drawn to it. Thank you for sharing about your heritage. What a serene area of art to explore. 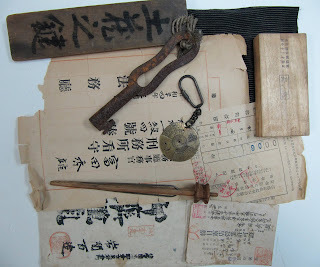 Fascinating flea market finds..must be so many interesting treasure to explore at such a market. As I've probably said before, as a young girl I lived for in Japan for a few years in the 50's. Like here, it has changed so much. My memories of it are so wonderful and it influenced so many things in my life. Hopefully there are still some areas that have remained the same. so beatiful, the balance and beauty in the collage--a wonderful introduction, thank you. when i think of the glimpse of "you" here, you seem to understand an eternal heritage, and express it from the inner heart so simply. its wonderful to witness. wonderful post as ever! your flea market find is so intriguing and your collage so beautiful. and thank you for the introduction to Horiuchi - great works!! "recycle" shop! And it's so fitting with the ideas about heritage, and your beautiful exploration. So exciting that you are already planning to return to Japan again. wonderful blog! just discovering it. Thank you! Wonderful collage! Good luck on this venture.